Featuring dance tunes from the popular and extensive Playford collection (1651-1728) this is a course for competent instrumentalists who want to take their playing to the next level. With expert guidance from Karen Wimhurst, Richard Heacock & Paul Hutchinson, you’ll explore harmony, rhythm, articulation, accompaniment, improvisation and arrangement, all the things you need for a stylish performance. Most instruments can be catered for, but you’ll need to read music sufficiently well to learn the tunes and play them up to speed. Sheet music and recordings will be available to download in advance. 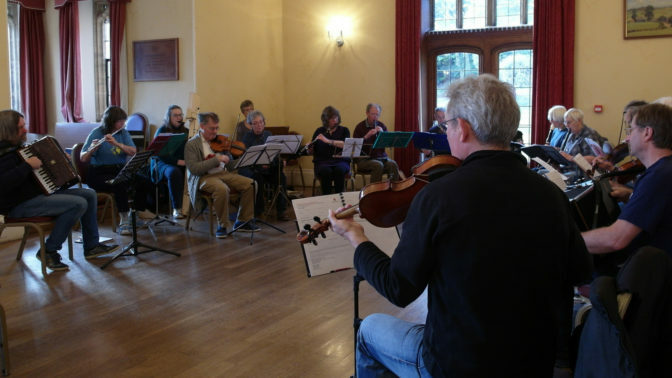 Richard Heacock is a violinist, and started playing for folk dance in Oxfordshire, with the Vale Islanders Playford group and Icknield Way Morris. He played in English traditional group Boldwood for many years and produced their first CD “Feet Don’t Fail Me Now”. He currently plays in Breton trio The Andro Sisters and appeared as an on-screen musician in two series of BBC TV’s “Poldark.” Besides previous Halsway visits as a tutor on Playing Playford courses, Richard also played for the first French and Breton dance course (with Paul Hutchinson) and for the Poldark Dance Weekend. Paul Hutchinson studied piano and church organ before being persuaded at the age of 17 to take up the accordion and form a ceilidh band. Since then he’s become one of the best-known and in demand players on the folk scene – in the UK and beyond – as one half of duo Belshazzar’s Feast, with trio Hoover the Dog, Pagoda Project (with Karen Wimhurst), and PLF. Paul is a regular tutor and musician at Halsway Manor, and the accordion tutor for EFDSS at Cecil Sharp House.